They have hundreds of winter lines available, from Christmas trees, lights and decorations to fruit trees and discounted shrubs. Up To 75% Off Spring Flowering Bulbs!! Code: AFF0017 When Prompted. Offer Excludes Delivery Charges. £10-Off (Half-Price) Tree-mendous Christmas Cards. Normally £19.99, now just £9.99. These ‘living’ Christmas cards make the perfect gift. Watch the tree grow year-after-year! Delivery (SH&I). Just place your order and enter Promo code: AFF0020 when prompted. click through to the offer and enter Promo Code: AFF0025 when prompted. FREE PRUNERS WORTH £9.99 with the Abundance Rose Collection – Just £14.99 (+P&P). Simply click through to the offer and enter Promo Code: AFF0027 when prompted. Promo Code: AFF0031 when prompted. 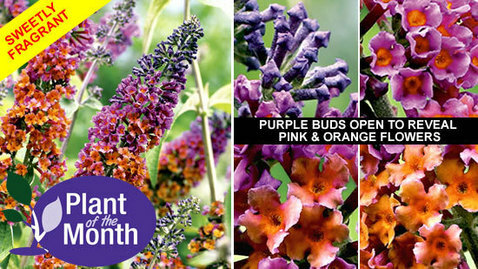 Totally new and unique, Buddleia ‘Flower Power’ is the show-stopping result of years of painstaking plant breeding. Relatively compact, hardy and easy to grow, its dazzling displays of colour and sweet scent will last all Summer long, turning your garden into a haven for bees and butterflies. 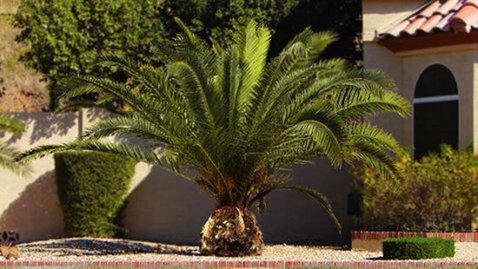 The plants supplied are large, well established and ready to flower every year, for many years. Order now stocks are strictly limited!! Comes from a dry island so you know it’s good without rain! Fruit tree bargains – you have to see these! Fantastic value – would make a brilliant early Christmas present for anyone! Perfect if you have kids as they will enjoy planting it and picking the fruit in the years to come! Encourages healthy eating and a perfect way of saving money on your fruit bills in the future. What you get – trees that are 5ft tall! They’ll only grow to about 7ft so are ideal for small gardens. They’ll prefer sunshine but will be happy with dappled shade but not full shade. Order some today and you could be planting your own orchard really soon! 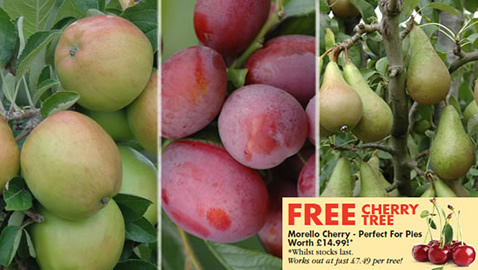 These are great value and over the lifetime of the trees the fruit will be virtually free. You will be picking your own fruit for years to come and the trees take very little care. Plant them at least 6ft apart though so they have plenty of room to stretch out and you can walk between the trees still. They will fill out over a few years. They need a light prune in the winter. Instructions are given and it’s not complicated. Prepare the soil well. You don’t move trees so get it right first time. Dig the hole to the right depth and then add some Blood, Fish & Bone organic fertilizer. Follow the instructions carefully – start digging the holes when you order the trees so they are ready to be planted as soon as they arrive. Braeburn trees are renown for their massive cropping – and even in the first growing season these trees will yield several pounds of juicy, crisp, mouth watering fruit, thereafter the crop size just gets bigger and bigger every year. They are ready to enjoy from September onwards, and if stored in a cool place will last up to three months. Home freezing will allow you to savour that delicious Braeburn flavour all year round. Everyone knows that ripe juicy British pears are one of the most succulent fruits you can eat. The ‘Conference’ variety has a flavour of it’s own which is just simply sublime. Once established your tree will produce over 100lbs of delicious fruit every year. You can pick your fruits whilst hard from mid-September to store in a cool place – then allow them to ripen in a bowl at room temperature as required. Alternatively just leave them to ripen naturally on the tree during October. Once tasted never forgotten. Our Victoria Plum tree is a popular classic offering incredibly juicy flavoured fruit and bumper crops year-upon-year. You can expect your tree to be laden with at least 100lbs of fruit for the next 30 years and beyond. Harvest from late July onwards, Victorias are ideal for jams, preserves and pies, or if kept in the freezer you can enjoy these beauties all year round. These three are classics and you will pick lots of fruit each year. Each basket is a generous 14” (35cm) diameter and holds 12 litres of compost, allowing maximum root growth AND ensuring each plant reaches its full potential every single time. The ‘Lattice Gated’ planting holes take the guesswork out of how and where to plant and critically, allow you to plant from the outside in – so there’s no crushing or mushing of the roots and no tearing or bruising of the leaves! Simply pass the root-ball through the hole, slide in the ‘Lattice Gate’ and lock into place. Once in position, the ‘Gates’ allow plenty of airflow ensuring the roots do not ‘sweat’. The result – rampantly healthy plants and an instant impact display that will grow in to a spectacular 3ft ball of colour!! 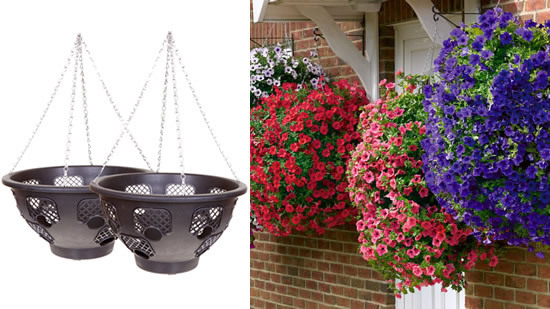 Each basket holds up to 18 plants and is perfect for growing winter pansies, strawberries, trailing tomatoes or even herbs; use them throughout the whole year! * Strong rust-proof ‘galvanized’ steel chain with 4 anchor points for better balance and less twisting – also with ‘T’ bar attachments for quick and easy application. Start with the bottom layer of plants – this is four plants.Ensure there’s compost put in and put then plants through and then click the cage bit in place to secure the plants. This doesn’t damage the plants and is easy for them to grow through. Mix in water retaining gel to the compost so it doesn’t dry out as much. Top up with compost and then put the next 8 plants in. Again the cages just clip over to stop them falling out. Fill up again with more compost – pile it high so when it’s watered it’s still full! In the top put 6 plants in. Put in place and water well!